Winnifred (Castle) Olsen holds a from B.A. Washington State College, 1938. She worked as Tacoma Public Schools Northwest History Specialist from 1967-84 and is the author of “For the Record—A History of the Tacoma Public Schools,” published in 1985. She was recognized as a WSU Alumna of Achievement in 1997. 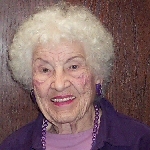 She received the Washington State Retired Teacher’s Outreach Award in 2000 and the Olympia YWCA Lifetime Achievement 2003. She has been a member of the Thurston County Historic Commission since 1984. Mrs. Olsen was the guiding force for the Bush Family Interpretative Center project, completed in 1997 on the Bush Land Claim in Tumwater and has spoken and written widely on the Bush family.